Precious metals advanced together Tuesday, marking gains ranging from 0.5% for both gold and palladium to 1.9% for platinum. Silver was in the middle, rising 0.9%. Gold for April delivery gained $7 to settle at $1,298.10 an ounce on the Comex division of the New York Mercantile Exchange. "A lower U.S. dollar index on this day and a mild U.S. inflation report are also friendly for the precious metals markets," Jim Wyckoff, a senior analyst at Kitco Metals Inc., said in a report. "Gold and silver bulls have regained some technical strength this week." Earlier Tuesday, the U.S. Labor Department said consumer prices in February rose 0.2% and annual inflation rose 1.5% for the slowest pace since September 2016. 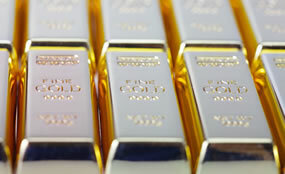 Gold futures ranged from a low of $1,292 to a high of $1,299.80. They slipped 0.6% on Monday. Silver for May delivery added 13.9 cents to close at $15.413 an ounce. Silver futures traded between $15.31 and $15.49. They declined 0.5% on Monday. April platinum advanced $15.10 to $831.90 an ounce, ranging from $819.40 to $838. Palladium for June delivery added $8 to $1,490 an ounce, trading between $1,488 and $1,508.90. Gold rose $4.30, or 0.3%, to $1,297.05 an ounce. Silver added 15 cents, or 1%, to $15.445 an ounce.